Divio Cloud projects allow you to maintain separate configuration for each of the Live, Test and Local environments. Environment variables are dynamic values that can be used by the processes or applications running on the server. One of the advantages in using them is that you can isolate specific values from your codebase. Environment variables are a good place for storing instance-specific configuration, such as Django settings that you don’t wish to hard-code into your project. On Cloud sites, environment variables for a project are managed via the command line, or via the Control Panel. The variables for the Live and Test sites are wholly independent. See the divio project env-vars reference for more. In the project, select Environment Variables. Enter the keys and values, and Save. Your local site also uses environment variables, contained in the .env-local file. Lines should not contain spaces or quotation marks (see Docker’s documentation). As you can see from the local environment examples above, environment variables can also be used to apply Django settings, such as DEBUG. It’s important to note that if your variable represents anything other than a string, you will need to interpret the variable appropriately, as os.environ.get will only return a string. You can also use env() (from the getenv package), which will parse the variable as Python code. Environment variables should apply only to environments, and not to states or processes that are independent of a particular environment. When a project is running, it runs in a particular environment, so you can expect environment variables to apply. When a project is being built (i.e. in the deployment phase), it should not be subject to any particular environment conditions. Even Django operations that take place during deployment (such as collectstatic) should be environment-agnostic - under all environment conditions, you should expect the same result from collectstatic. However, it’s usually better to find another solution. 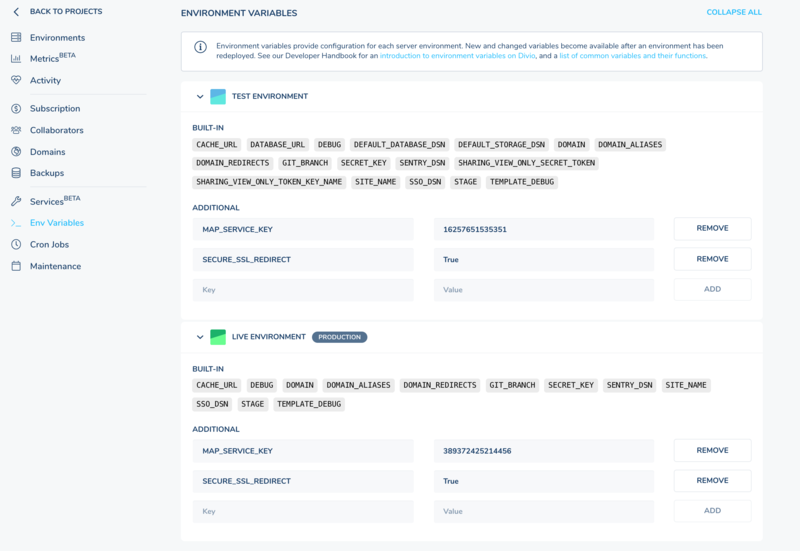 Many of the applications packaged for Divio Cloud deployment recognise a number of environment variables for your convenience. See Key Divio Cloud addons for lists of settings that can be provided as variables in some Divio Cloud addons. Our uWSGI application gateway also recognises environment variables that commence UWSGI_.